Purpose: The purpose of this systematic review is to identify clinical outcomes, health care utilization and costs associated with teledentistry. Relevant databases were searched for articles on teledentistry published until March 2012, reference lists examined and key journals hand searched. Of a possible 58 articles, 19 studies met the inclusion criteria. Clinical outcomes were generally improved following a teledentistry intervention and satisfaction with teledentistry was consistently high. The few studies examining health care utilization reported mixed findings, but preliminary evidence suggests cost savings for health care facilities. There is a consistent trend in the literature supporting the efficacy and effectiveness of teledentistry. Further research is needed to identify the effectiveness, efficiency, utilization and costs of teledentistry as it could provide the key to improving access to care. Systematic reviews help summarize and critically synthesize the available body of literature and are useful in clinical decision-making and program planning, especially in a newer research area where quality and scope of studies is variable.4 Systematic reviews also help to identify areas in which research is currently lacking.4-7 While there is a growing body of literature on teledentistry, no systematic reviews have been published. Jennett et al conducted a systematic review of the socio-economic impact of general telehealth.8 Dentistry was one of several areas examined in a brief overview of the types of socio-economic outcomes used in the teledentistry studies and the number of studies demonstrating benefits on those outcomes. This paper provides a systematic review of the scientific literature in order to evaluate the efficacy, effectiveness and costs of teledentistry used for direct patient services, specifically clinical outcomes, health care utilization and costs related to teledentistry. These outcomes were selected to reflect a common objective of teledentistry programs - to provide access to quality services while minimizing costs. For the present study, teledentistry is defined as the use of communication and information technologies to provide clinical services from a distance. Electronic databases were searched to identify relevant articles. Searches were limited to the English language and publication date from the earliest available date for each database to March 2012. Literature searches were conducted using PubMed/Medline, EMBASE, CINAHL with Full Text, PsychINFO, EBM Reviews (e.g. Cochrane Database of Systematic Reviews, ACP Journal Club, Database of Abstracts of Reviews of Effects, Cochrane Central Register of Controlled Trials, Cochrane Methodology Register, Health Technology Assessment and NHS Economic Evaluation Database), Scopus, Education Resource Information Center (ERIC), Google Scholar and Turning Research into Practice (TRIP). The search strategies included subject headings and subheadings (if available) combined with keyword searching. The search concepts included teledentistry, telemedicine, telehealth, remote consultation, cost effectiveness, outcome, dentistry and dental services. Studies were included if they were designed as an interventional study (experimental and observations based on judgments from teledentistry images), used quantitative or qualitative approaches, and presented findings related to outcomes or costs. There were no restrictions for age or care setting (e.g., home, community or facility). Studies were excluded if they included only telephone interventions (unless telephone intervention was one group of the study, with a video component in the other, or unless other technologies were paired with the use of the telephone), the technology was smart home monitoring devices, examined telehome care of patients with chronic disease who received only nursing interventions with no dental care objective, reported only the development phase of the technology (i.e., feasibility of the technology in a lab setting), examined only the support for caregivers of patients, were program descriptions or reports not designed as research studies, and were redundant articles which dealt with the same intervention and did not report any new outcomes. Studies were also excluded if they provided insufficient information to allow adequate interpretation of the study design, measures or results, or if they were only found in abstract form, in abstracts or posters from conference proceedings. Based on the identified criteria, potential eligible articles were first determined by examining article titles and abstracts from the database searches. Full-text articles were then retrieved and evaluated for relevance. Articles were excluded at this point if they failed to meet the criteria after the full texts were examined. Figure 1 represents the flow chart of identifying relevant articles for analysis. A second researcher reviewed all articles using the same criteria for inclusion and exclusion. The 2 reviewers compared selected articles, discussed differences of opinions holding each selection to the inclusion criteria and confirming the relevance and findings from the selected articles. A total of 19 articles were retained for analysis. As Figure 1 indicates, 19 studies were retained after the initial screening of 58 titles, abstracts and the full-text retrieval of pertinent articles.9-27 The search strategy and selection criteria did not limit the type of experimental or observational design. Articles of clinical outcomes focused on validity, accuracy and reliability of teledentistry in screening for dental caries, identification of oral mucosal lesions and orthodontic consults and referrals (Figure 2). 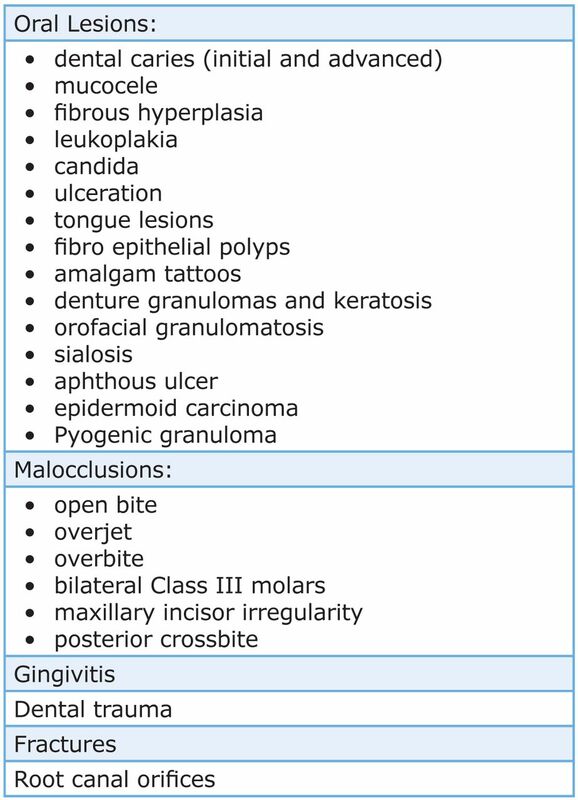 Access to an oral medicine specialist or oral pathologist for diagnosis of lesions is often limited, or long waiting periods exist. One feasibility study compared 2 specialists' teledentistry diagnosis of 25 cases to final diagnosis.21 Biopsy was performed in some cases to obtain exact pathology. The 2 examiners agreed on correct pathology in 60% of the cases. In the 10 remaining cases the examiners were not accurate with the diagnosis or they were not in agreement. One examiner correctly identified 88% of the 25 cases.21 In the final analysis, weighted kappa only resulted in fair agreement (K=0.28). In summary, there are fewer studies that examined satisfaction outcomes as compared to clinical outcomes. Nevertheless, there is a trend of good attendance at teledentistry programs and good compliance with 5 studies (26%) reporting on satisfaction.12,13,15,18,25 While 4 of these studies reported the clinicians' perspective, only 1 study 25 examined both patient and clinician perspectives. In a comparative-effectiveness study, the care utilization in preschool urban children enrolled for teledentistry examinations was as effective and accurate as traditional clinical exams for dental caries screening.27 No significant difference was found between groups. Ignatius et al's 2005 report studied cost of teledentistry technologies for 26 dental specialist trainees in 8 cities in Finland.15 Costs were calculated for travel, purchase and equipment operation. The use of teledentistry was estimated to save each student at least 43,600 Euros. More specifically, this systematic review of teledentistry showed that although there is heterogeneity between studies in terms of study designs, clienteles, settings and outcomes measured, a trend exists supporting the efficacy and effectiveness of teledentistry. Many quality studies, including studies with control groups, reported similar or better clinical outcomes when compared to conventional interventions. Use of teledentistry resulted in slightly higher DFS scores than those found in clinical examinations of the same children10,17,20,22,27 When screening groups of young children, referral for care based on a false positive is not as detrimental as non-referral based on a false negative. One study reported the incorporation of a 1 credit hour, 15 week teledentistry course in a dental hygiene program.16 Students' knowledge, attitudes and confidence were evaluated prior to and following the course. Confidence, knowledge and attitudes were significantly different on 9 of the 10 item questionnaire following the course. Including a teledentistry course within the curriculum provides oral care professionals the skills needed to improve access to care. Overall, satisfaction ratings regarding the use of teledentistry were very high from both patients and therapists, regardless of the patient population, setting or study design. However, certain measurement issues limit the usefulness of the reported data. For example, the tools used to measure satisfaction are for the most part poorly described and not standardized. The underlying satisfaction concept is often vague, making the interpretation of satisfaction findings unclear. Findings are generally limited to satisfaction with the technology, the service received/given, but there are no details of the service delivery or their experience in the program. The findings in this review are similar to the conclusions arrived at by Mair33 as well as Williams et al34 in their systematic reviews of studies reporting patient satisfaction with telemedicine. Continuing to measure user satisfaction in the current manner will simply confirm previous findings of acceptability of the technology, but will not increase the understanding of the underlying processes of teledentistry use. A better understanding of satisfaction remains an important area for future research in teledentistry. The use of teledentistry for screening of oral diseases to determine prevalence and treatment needs, and provide access to specialists for consultations, is promising. Oral diseases impact health and quality of life for many. Expanding the roles of dental hygienists and removing practice restrictions would increase the number of oral care providers who could perform screenings, care and referrals using teledentistry. Reduced costs or better resource utilization is often cited as one of the main goals of teledentistry.11,15 In conducting cost analyses, it is crucial to identify from which perspective the analysis is being conducted - in other words, who is defraying the costs or achieving the savings, be it the patient, caregiver, clinician, health care organization, health care system, reimbursement agency, society and so on. None of the studies presented here calculated costs using the same elements. While the studies in this review included calculations of costs incurred or saved from an organizational or patient perspective, the costs were not related to clinical or health care utilization outcomes. If outcomes are similar between a teledentistry program and an alternative program, then cost-minimization or the cheaper of the 2 interventions is an appropriate measure of costs. If outcomes are different, then it is more relevant to identify how much more or less a teledentistry program costs compared to an alternative, taking into account the change in clinical outcomes of each program. Cost differentials such as the incremental cost-effectiveness ratio can be useful in this case. It is generally accepted in meta-analyses and systematic reviews that clinical trials, particularly RCTs and other quasi-experimental designs, are best suited for assessing the efficacy and cost-effectiveness of an intervention, and thus provide stronger evidence on which to base conclusions. Common methodological weaknesses in these studies included lack of blinding of dentists, patients or assessors. While in teledentistry it is not always feasible to design studies with patients and dentists who are not aware of group assignment, use of outside assessors reduces the potential for evaluation bias. Many of the studies used convenience samples based on geographical location of patients or patient preference, clearly introducing the possibility of selection bias. A total of 12 studies (60%) had sample sizes of fewer than 20 subjects, and only 1 of the studies provided power calculations.13 Small sample sizes can lead authors to conclude that no significant difference exists between groups, i.e. a Type II error, whereas the study may have insufficient power to identify a significant difference.28,29 Nevertheless, larger studies often remain challenging to carry out, as many of the teledentistry programs are still in their pilot phases and there is often limited availability of the patient population concerned. Another limitation of this systematic review is that it uses studies published in peer-reviewed journals. It is well documented that there is a publication bias toward studies that have positive findings.36 Therefore, studies that do not demonstrate any effect or report a negative effect of teledentistry may not carry as much weight in the synthesis of the data because they were not identified through the search. Moreover, this review did not include patient assessment studies as the focus was on intervention programs. This systematic review identified a substantial amount of scientific literature in the relatively new area of teledentistry. Although there is heterogeneity between studies in terms of study designs, settings and outcomes measured, there is a consistent trend supporting the efficacy and effectiveness of teledentistry. Further research in the area of teledentistry, with methodologically stronger studies examining clinical outcomes, health care utilization and costs in greater depth are critical for evidence base. From the data available, teledentistry seems to be a promising path for access to care in rural and urban settings. The authors wish to acknowledge the support of their respective departments in the development of this manuscript. Susan J. Daniel, RDH, PhD, is Assistant Professor, Department of Dental Hygiene. Lin Wu, MLIS, AHIP, is an Associate Professor & Reference Librarian, Health Sciences Library. Sajeesh Kumar, PhD, is an Associate Professor, Department of Health Informatics & Information College of Allied Health Sciences. All authors are at the University of Tennessee Health Science Center, Memphis. This study supports the NDHRA priority area, Health Promotion/Disease Prevention: Identify, describe and explain mechanisms that promote access to oral health care, e.g. financial, physical, transportation.
. Teledentistry: What is it now, and what will it be tomorrow? J Calif Dent Assoc. 2000;28(2):121–127.
. Using teledentistry to provide interceptive orthodontic services to disadvantaged children. Am J Orthod Dentofacial Orthop. 2008;134(5):700-706.
. Teledentistry and its use in dental education. J Am Dent Assoc. 2003;134(3):342–346.
. Research. In: Geurink KV, eds. Community Oral Health Practice for the Dental Hygienist. 3rd ed. St. Louis, MO. Mosby/Elsevier Publishing. 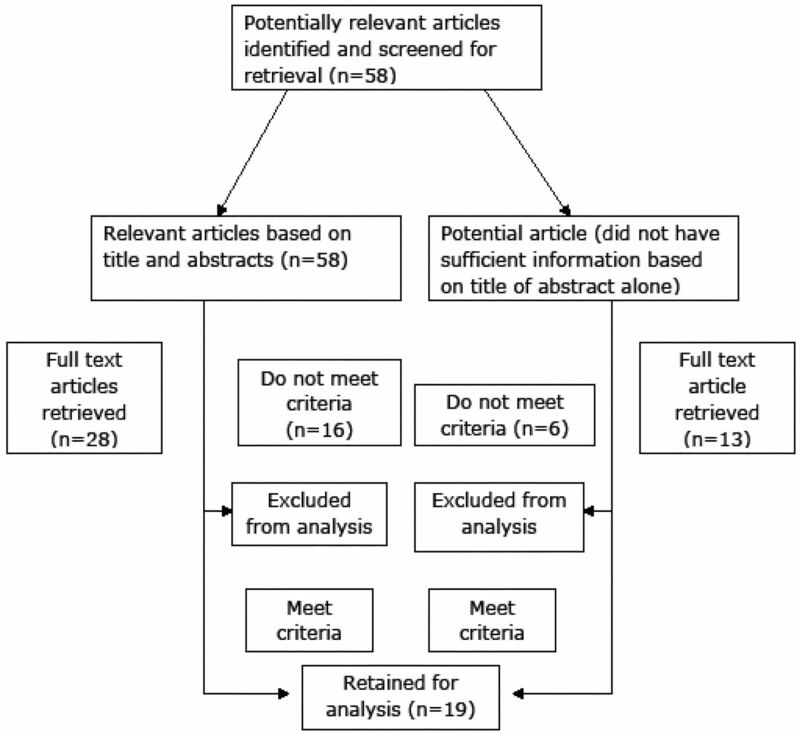 2012. p. 203.
. Papers that summarise other papers (systematic reviews and meta-analyses). BMJ. 1997;315(7109):672–675.
. Systematic reviews from astronomy to zoology: myths and misconceptions. BMJ. 2001;322(7278):98–101.
. The socioeconomic impact of telehealth: A systematic review. J Telemed Telecare. 2003;9(6):311–320.
. Teledentistry: protocols for the transmission of digitized radiographs of the temporomandibular joint. J Telemed Telecare. 1996;2(4):217-223.
. Dental screenings using telehealth technology: a pilot study. J Can Dent Assoc. 1998;64(11):806-810.
. An economic evaluation of the Highlands and Islands teledentistry project. J Telemed Telecare. 2002;8(3):165-177.
. Orthodontic referrals via TeleDent Southwest. Dent Clin North Am. 2002;46(3):507-520.
. Teledentistry for screening new patient orthodontic referrals. Part 1: A randomised controlled trial. Br Dent J. 2005;199(10):659-662.
. Teledentistry for screening new patient orthodontic referrals. Part 2: GDP perception of the referral system. Br Dent J. 2005;199(11):727-729.
. Teledentistry in dental specialist education in Finland. J Telemed Telecare. 2006;12:46-49.
. Knowledge, attitudes, and confidence levels of dental hygiene students regarding teledentistry. J Dent Hyg. 2007;81(4):114.
. Dental screening of preschool children using teledentistry: a feasibility study. Pediatric Dent. 2007;29(3):209-213.
. Profiling the interest of general dental practitioners in West Yorkshire in using teledentistry to obtain advice from orthodontic consultants. Prim Dent Care. 2007;14(3):117-122.
. Using teledentistry to provide interceptive orthodontic services to disadvantaged children. Am J Orthod Dentofacial Orthop. 2008; 134(5):700-706.
. Prevalence of dental caries in Early Head Start children as diagnosed using teledentistry. Pediatr Dent. 2008; 30(4):329-333.
. Email for distance diagnosis of oral diseases: a preliminary study of teledentistry. J Telemed Telecare. 2008;14(8):435-438.
. Remote diagnosis of children dental problems based on non-invasive photographs - a valid proceeding? Stud Health Technol Inform. 2009; 150:458-462.
. Application of teledentistry in oral medicine in a community dental service, N. Ireland. Br Dent J. 2010;209(8):399-404.
. Teledental consultations related to trauma in a Swiss telemedical center: a retrospective survey. Dent Traumatol. 2010; 26(3):223-227.
. Use of videoconferencing for consultation in dental prosthetics and oral rehabilitation. J Telemed Telecare. 2010;16(8):467-470.
. Recognition of root canal orifices at a distance - a preliminary study of teledentistry. J Telemed Telecare. 2011;17(3):154-157.
. Prevalence of dental caries and dental care utilisation in preschool urban children enrolled in a comparative-effectiveness study. Eur Arch Paediatr Dent. 2011;12(3):133-138.
. Clinical outcomes resulting from telemedicine interventions: a systematic review. BMC Med Inform Decis Mak. 2001;1:5.
. Evidence-based medicine: classifying the evidence from clinical trials – the need to consider other dimensions. Crit Care. 2006;10(5):232.
. Systematic review of evidence for the benefits of telemedicine. J Telemed Telecare. 2002;8(1):1–30.
. Diagnosis, access and outcomes: Update of a systematic review of telemedicine services. J Telemed Telecare. 2006;12(2):S3–31.
. Systematic review of home telemonitoring for chronic diseases: the evidence base. J Am Med Inform Assoc. 2007;14(3):269–277.
. Systematic review of studies of patient satisfaction with telemedicine. BMJ. 2000;320(7248):1517–1520.
. Limitations of patient satisfaction studies in telehealthcare: A systematic review of the literature. Telemed J E Health. 2001;7(4):293–316.
. Uses and abuses of meta-analysis. Clin Med. 2001;1(6):478–484.